Small and large tiles. How and where to use them? Because of their variety, ceramic tiles will look perfect in every interior. The only limiting factor is the creativity, fantasy and imagination – ours or our architect’s, as well as the size of individual tiles. There are some rules that you should follow when selecting the tile format for the interiors in which you want them to be laid. How about a combination of large and small tiles on one wall? The multiplicity of formats, colours and structures creates unlimited possibilities. Naturstone Collection, Ceramika Paradyż. Small-large format, that means what exactly? 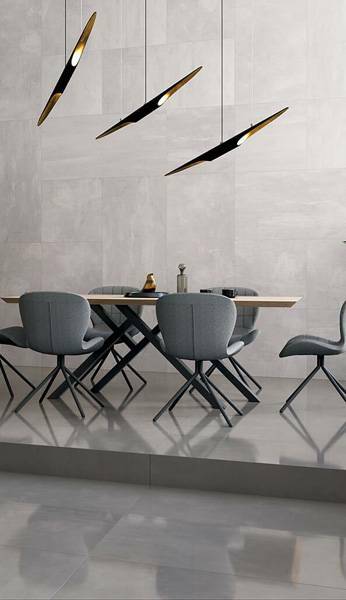 In the era of continuous technological development and resulting changes in the produced sizes (increasingly larger ceramic tile formats appear on the market every year), it is difficult to clearly indicate which tiles belong to the “small” category and which ones are “large”. Those considered quite large in the past are now seen as being downright small. Therefore, the following summary can be of help. Considered small are tiles ranging from 4.8 x 4.8 cm to 30 x 30 cm (squares) and rectangles whose sides are within the same limits (4.8 cm and 30 cm). Considered large are tiles – in square and rectangular formats – with sides longer than 30 cm. Small tiles, where to lay them? Ceramic tiles in smaller sizes are a great option for creative people who like an interesting and unconventional look. They look good on walls of large rooms. They can be freely combined with each other, creating interesting patterns. They can also be used on floors of smaller interiors and e.g. help to hide their defects and curvature. Easy transport and laying (small packages are lighter and easy to carry). Small losses in material (you can adjust them so that the need for tile cutting is minimised). Variety of patterns and colours that can be freely combined with each other. Small tiles perfectly fill the space between kitchen furniture. Rodari Collection, Ceramika Paradyż. Where can the large tiles be used? 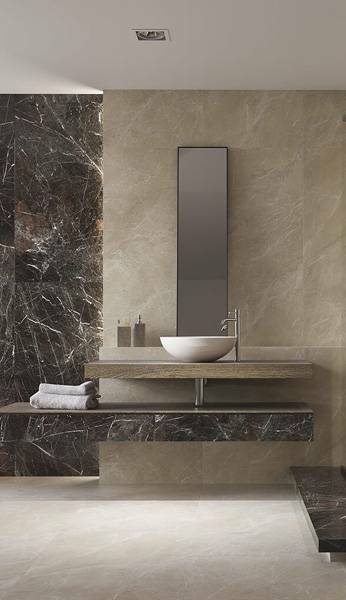 Large tiles are a perfect choice for those who value aesthetics, consistency and minimalism. They perfectly fit large interiors – both on walls and floors. 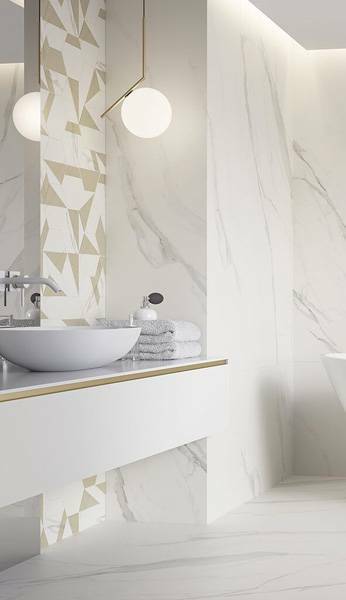 They create a uniform surface, making the rooms bright and minimalistic (mixing several patterns in the case of large tiles is not advisable). Easy laying – you have to stick and grout a lot fewer tiles than in the case of small formats. Straight surface giving a consistent and minimalistic character. Ability to achieve a uniform surface that will visually enlarge the room. 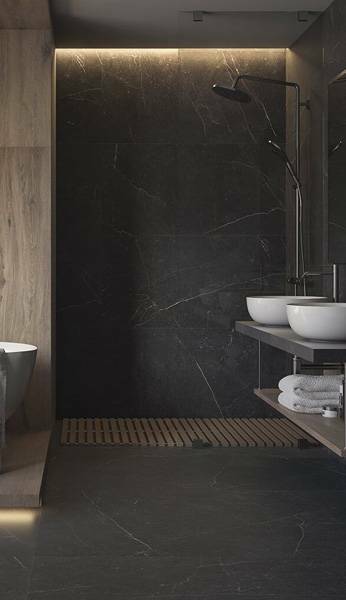 Large format tiles allow you to maintain a minimalistic character of interiors. Obsidiana collection format 59.8 x 59.8 Ceramika Paradyż. Ultimately, it all depends on individual approach, aesthetics and taste. Both large and small tiles can fit into any type of room. A good design, good materials and a sense that the interior meets our expectations are most important.